The photograph of Independence Hall used for this website's header & the book's cover is copyrighted by Daniel Ucko. The last President of America's First Republic, Cyrus Griffin, remains unmourned and unacknowledged in Bruton Parish Churchyard in Williamsburg beside the Table Tomb he so lovingly commissioned for his dear wife, Lady Christina Stuart Griffin. There, in an unmarked grave, buried "at the smallest expence possible in every respect," according to the dictate of his Will, Cyrus Griffin's remains have been interred in obscurity for two centuries. Of all the Founding Fathers, he is surely the most forgotten. Equally overlooked in the annals of American History is the critical role that the descendants of French Huguenots, including Cyrus Griffin, played in the founding of the United States. He was the fourth of the fourteen Presidents of the Continental Congress-Laurens, Jay, Boudinot and Griffin--who could trace his ancestors to those brave souls who fled the Protestant persecution that culminated in King Louis XIV's revocation of the Edict of Nantes in 1685. As the author of The Huguenots in America states, "they were the first major Continental European refugee group to settle in the British colonies of North America since the arrival of the Puritans half a century earlier." In addition to his congressional and executive duties, Cyrus devoted much of his public career to the law. In 1780, he was selected by his colleagues to serve on the Court of Appeals in Cases of Capture, the nation's first independent judiciary. 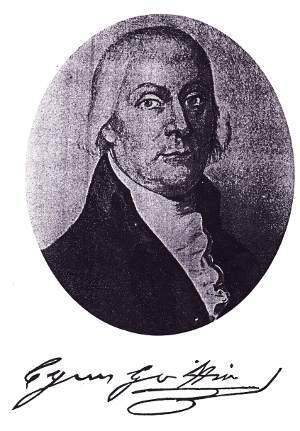 A decade later, after helping to complete the transition to America's Second Republic, Cyrus was appointed by his successor, President Washington, as the first Federal Judge for the District of Virginia. In that capacity, he joined Chief Justice John Marshall in presiding over the treason trial of Vice President Aaron Burr.